On this day, June 16, 38 years ago, about 20,000 students from across schools in Soweto, South Africa took to the streets to protest the injustice in the South African education system. These protests were in concert with the nationwide outrage against the oppressive Apartheid regime. As those children stared down bullets and police batons, they demanded for an education that was true to the history of the country and progressive in preparing them for the future. Their cause was honest and commendable, but the outcome of their demand was brutal. At least 176 of them (and possibly up to 700) were killed and several thousands injured by the same regime that criminalized their ambitions. In the years that followed, Apartheid was defeated; June 16 was memorialized as National Youth Day in South Africa; and the Organization of African Unity (now African Union) honoured the dead freedom fighters by declaring the day as Day of the African Child. South Africa’s education system has improved slightly, but there is still general discontent with the direction of education in the country. Across the continent, the story extends far beyond discontent – Africa faces a full-blown war against education launched by extremists, militants, primitive cultural practices and lack of social infrastructure to drive large-scale change. 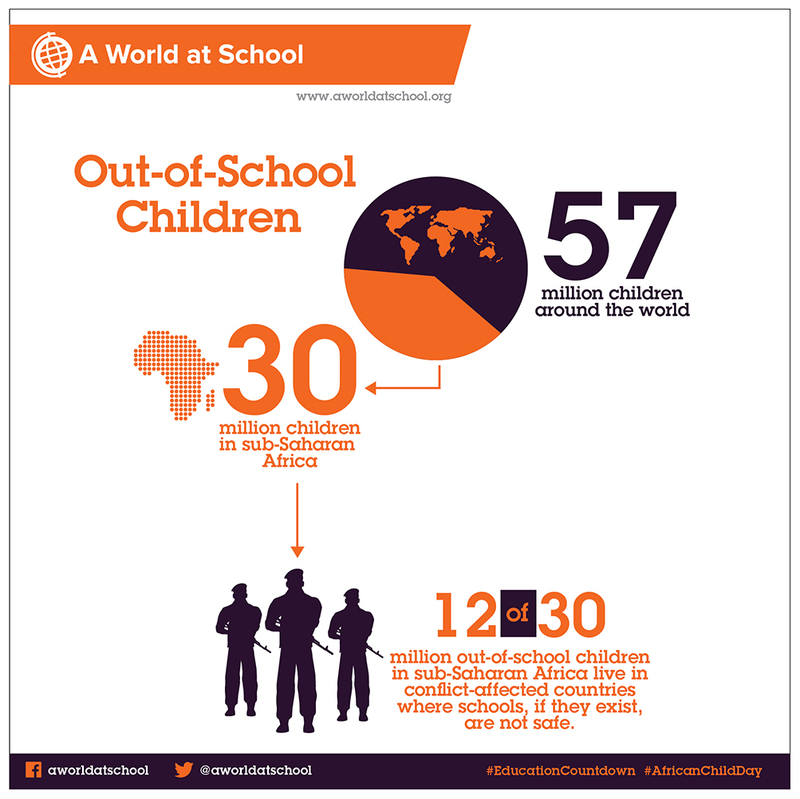 A World at School, a global education advocacy organization estimates that 22% of school-aged children in Africa are currently out of school; that amounts to over 30 million children in Sub-Saharan Africa, almost half of whom live in conflict-affected countries. Nigeria, the country with the highest population of out-of-school children in the world (10.5 million), has fought a long-standing war with extremist terrorists Boko Haram who have bombed schools, kidnapped hundreds of school children and created general unrest in the north of the country. Half of school-aged children in South Sudan (1.3 million) are out of school, with one of the least investments in education of any country in the world. 58% of primary school aged children are out of school in Somalia, and continuous unrest in the Democratic Republic of Congo has kept 2.4 million children out of school there. 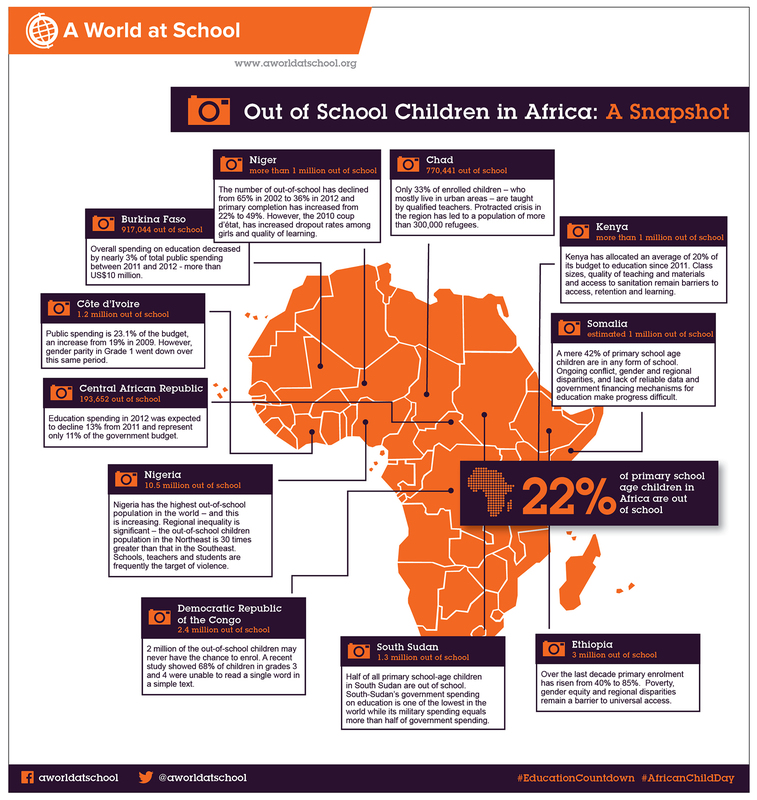 As African economies continue to impress global watchers through progressive GDP rates, there is a desperate need for African countries to secure their futures by investing massively in creating equitable access to education for millions of unschooled children across the continent. For the children who are fortunate enough to be in school, the fear of death and destruction hangs ominously over them as schools have become easy targets for misguided militants. There is also an urgent need to ensure that the education delivered across the continent meets global quality standards and stays relevant for the growing demands of the 21st century. There is so much to be done, but this Day of the African Child reminds us of the power of youth to change the course of any nation. Indeed, the future of Africa rests with the children of today and the youth of tomorrow.